The question at the surface of Alexander Payne’s newest feature is; what would you do with a million dollars? Although the very fabric of this question is at the core of Payne‘s newest film, whether or not Woody Grant (Bruce Dern) receives his loot and the events that lead as result of his winnings are actually the least interesting aspects of Payne’s little piece of Americana. 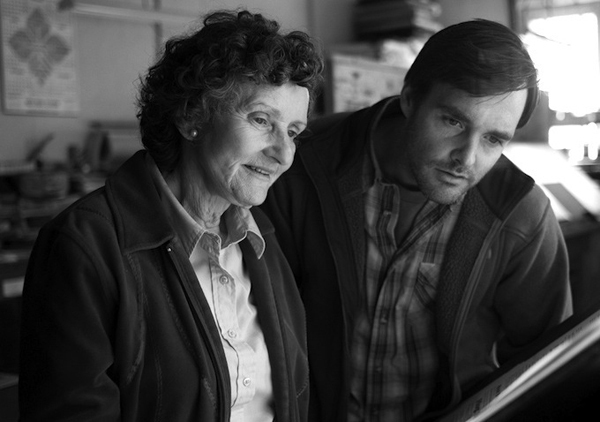 Instead, what comes to the forefront of Payne‘s quaint independent feature is the relationship between this ailing alcoholic and his son David (Will Forte) and the small adventure they share together that wouldn’t be too far fetched as a trip with your own old man. One of the most consistent characteristics of an Alexander Payne film is his focused vision and of course his ability to surprise us with his choice of actors and their undeniable charm. Payne, who’s position as a writer is vacant from the credits, instead puts his focus on directing Dern and the rest of the cast to acting bliss. Woody, an aging booze-addled Hillbilly makes his way into our hearts with very little words and timidly transparent gestures. By the end of the film, Woody’s successes (although few) shine over his many failures. One of the most surprising performances of the film is by Forte as the always understanding and overly forgiving younger son David. David, who always had to live in the shadow of his ambitious, go-getter brother Ross (Bob Odenkirk), poses great questions to Woody’s thoughts on love, life and the pursuit of happiness. Not to mention the chemistry between Dern and Forte is somewhat of a cinematic marvel. 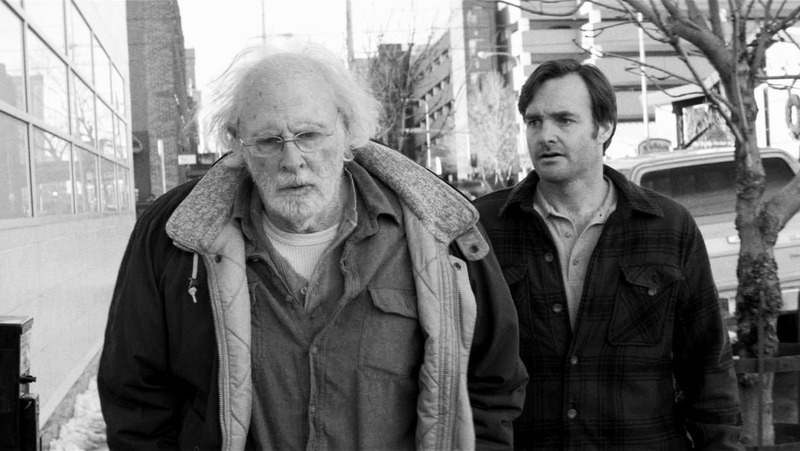 Nebraska has an ingeniously stylistic film-making approach and is formulated into a highly affective lasting anecdote. The setting surrounded by large empty plains, as well as the choice to screen the film in black and white, seemed a bit gimmicky at first. As the characters within the film begin to resonate, a pattern of behaviour starts to take shape. Not only does the black and white aesthetic add to the commentary in which Payne is making about these simplistic people and their mundane lifestyle, but it is a creative juxtaposition in that many of the people who inhabit that lifestyle usually don’t have many choices–other than the plain black or stark white life choices predestined to them, without much grey in-between. The progression of the lives of the resident’s of Hawthorne is best explained by Woody’s gossip-queen wife Kate, who has an encyclopedia of dirt, backstories and not-so-small tabs on everyone in the town. Her constant judgement of people in the town she left behind adds as a fantastic contrast against the falsified life she, along with her family, leads in Montana. Surprisingly enough, one of the most important characters in the film, a character that allows all the other characters to reach their monumental highs and embarrassing lows, is the symbol of the questionable lottery winnings. Ironically enough, the questionable million dollars that Woody has luckily obtained, shows the reality of such fortune and the inherent misfortunes it brings. As the deep family history and greed begins to take hold of the better part of each character, far-forgotten instances of the past are re-hashed along with individuals who have long left Woody’s life. One of these individuals is Ed Pegram (Stacy Keach), an old-buisness partner to Woody and untrustworthy friend. Keach, who was throughly convincing as the leader of a white supremacist group in Tony Kaye’s cult-classic American History X, inherits evil and becomes real-world menacing in a way only Keach could pull off. Pegram along with unsuspecting members of Woody’s family become a mob of expectations for Woody’s kind-hearted, generous ways. 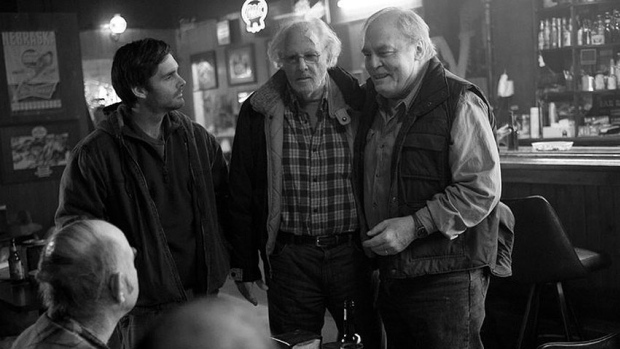 Nebraska becomes a reminiscent slice of real-life. Focusing on a low income household, with familial inconsistencies and moments of poetic irony, the film is a wise and weathered cautionary tale. What may seem unconventionally bizarre and just plain weird to some families, becomes the norm for others. Nebraska is filled with scenes involving the Grant’s that just don’t make sense, but it allows each member of the family to bond and connect in ways that only unexpected circumstances could foster. There lies the beauty of family. Not only is much of the film bristled with dry dialogue, callous humour, and a black and white film stock, but the subject matter will definitely have issues finding a niche audience outside the festival and award demographic. Sadly, Nebraska is a film with a ton to say. Uninterested in giving expected narrative hand-outs and warm emotional tokens of redemption, the film is never a disillusioned scam. Heart-rendering and unexpectedly warming, Nebraska solidifies the idea that the illusion of something is much more important than the actual thing itself. As the mileage accumulates and the two estranged family members embark on what seems to be a disenchanted ending, the voice of Payne becomes clearer than ever. What starts off as a simple father/son road trip movie becomes a harrowing and sometimes haunting tale of the midwestern American life and a strong candid perspective on alcoholism. From the first gas stop, Woody, who seems to be entranced by the allure of alcohol, always finds his way to a barstool. Even as the wheels stop turning and the two make their way into the homes of family members, beer and hard liquor, according to Payne‘s world, becomes the preferred pastime of the small town folk. Although David’s intent, from the moment they get into the car was one romanticized with life-changing bonding and dialogue involving the faults of his father’s past and his errors along the way as a husband and as a father, he comes to the realization that sometimes people won’t change, don’t change and just simply can’t change. Instead, Woody finds something to live for at the bottom of the bottle. By the end of Nebraska, we can’t help but put our hand to our mouths and smell the hops in our breath, intoxicated by the people within Payne’s narrative and the tipsy cinematic road trip we just buckled up for. Night Film Reviews: 8/10 Stars. Still buzzing from Nebraska? Or experiencing an unpleasant cinematic hangover? Leave your thoughts below and comments surrounding one of the most talked about independent features of the year. This entry was posted in Reviews and tagged Alexander Payne, Bruce Dern, June Squibb, Nebraska, Night Film Reviews, Reviews, Stacy Keach, Will Forte. Bookmark the permalink.